Lightweight Miguel Angel Huerto (25-8-1, 17 KOs) defeated Efren Hinojosa (29-4-1, 17 KOs) by 12-round unanimous decision, winning the NABF lightweight title in an impressive performance on Thursday night at the Grand Plaza in Houston, Texas. 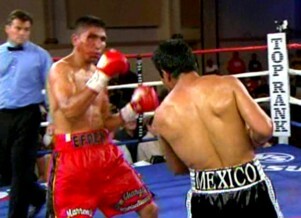 Huerta, ranked # 13 in the WBC, knocked Hinojosa down in the 2nd round and had him on the verge of a knockout. However, Hinojosa somehow survived the round despite taking terrific punishment from Huerta, who put on a left hook clinic all fight long and showed outstanding skills along the way. This was the first fight back for Huerta after losing a 12-round split decision to Almazbek “Kid Diamond” Raiymkulov in June, and Huerta had a lot of reasons to want to look good, considering he felt that the loss was unjustified. As it would turn out, there was no controversy this time, as Huerta easily won by the scores 120-106, 119-107 and 118-109. In the early going, Hinojosa, a fighter that is on the downward part of his career, constantly came forward and pressed the action with jabs and straight right hands. In contrast, almost none of Huerta’s punches were straight, as he tended to throw almost exclusively hooks. Adding to that, Huerta’s punches had a lot more steam on them compared to Hinojosa’s weaker shots, which were thrown mostly while moving. On numerous occasions, Huerta punished Hinojosa with powerful left hooks, driving him back to the ropes where he would get tagged again. The fight was essentially one-sided for the entire fight, as Hinojosa was never able to match Huerta with any real sustained attack that had any effect on him. Each time that he would come forward, Huerta would immediately stop him in his tracks with a powerful left hook, and then follow up with more shots as Hinojosa would back away and try to cover up. In the sixth round, Hinojosa was cut badly over his right eye, and it would continue to bleed for the rest of the fight, covering both fighters with blood.